The Katy Prairie Conservancy has organized several seed collecting trips this fall, some to prairies not usually open to the public. All are welcome to participate. Take a look and sign up! Fall is the major seed collecting season for our coastal tallgrass prairie. Trips have been scheduled to collect at some of the best local prairies, so join us to enjoy a morning outdoors with fellow conservationists, learn from prairie experts, and help prairie habitats with your volunteerism. 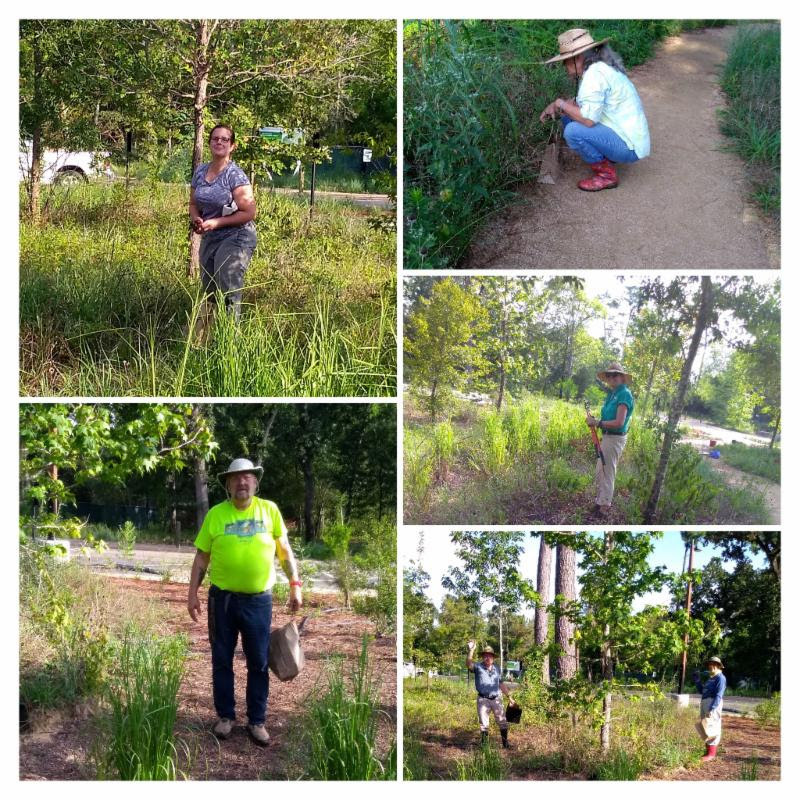 KPC and Gulf Coast Master Naturalist volunteers, led by Theo Ostler, collect seeds at Houston Arboretum (HANC) on August 29, 2018. Emily Manderson, Conservation Director at HANC, dropped by to say hello and said that she was glad the seeds could be used for important restoration projects. Thanks to the volunteers who took seeds home to dry! You may sign up starting now for any of these trips. Reminders will be sent to registrants the week of the event. We may also schedule some impromptu trips, such as one to the Houston Arboretum, when the purple top grass is ready to collect. To be put on the KPC seed collecting email list, send an email to LShen@katyprairie.org. Please arrive promptly at 9:00 a.m. to enter the locked gate together. If you register, you will be given an event day cell phone number that you can call, should you arrive late. This is a great opportunity to see the UH Coastal Center, normally not open to the public. The Center contains about 300 acres of tallgrass prairie and is one of the earliest high-quality prairies that has been protected and you can view photos in this photo gallery. Meet at 1222 E. Purdue Lane, Deer Park, Texas 77536 (Google map). Please do not park directly in front of neighbors’ houses. Please do bring a signed liability release (NPAT) if you do not have one on file from the past year. Carpool: Reply to this email for carpooling opportunity from the Kroger parking lot at S. Post Oak & W. Bellfort or from a residential area adjacent to S. Main & Buffalo Speedway. The prairie is usually lovely at this time of year, as the gulf muhly should be in bloom, creating a purple pink mist broken by intensely colored blue sage and the bright yellows of the swamp sunflower and silkgrass. Meet at Nash Prairie. Park on County Rd 255 (Orozimbo Rd.) and walk across the street to the prairie. We will meet at the start of the gravel road – the red marker on this map. Carpool: Reply to this email for carpooling opportunity from the Kroger parking lot at S. Post Oak & W. Bellfort at 7:45 a.m. Please do bring a signed NPAT liability release if you do not have one on file from the past year. Join us for a weekend seed collecting opportunity. Please do bring a signed NPAT liability release. At KPC and Deer Park Prairie, you may collect for KPC, for any other non-profit organization, or for your own personal use.